Boys' basketball: Alec Hazlewood hits two late foul shots as Westbrook sends Portland to a second loss. PORTLAND — Alec Hazlewood made two foul shots with seven seconds remaining to give Westbrook a one-point lead and the Blue Blazes withstood a last attempt by Portland to take a 46-45 SMAA boys’ basketball victory Tuesday night at the Portland Expo. The fifth-ranked Blazes (10-3) scored the last eight points for a 10-2 edge in the fourth quarter. 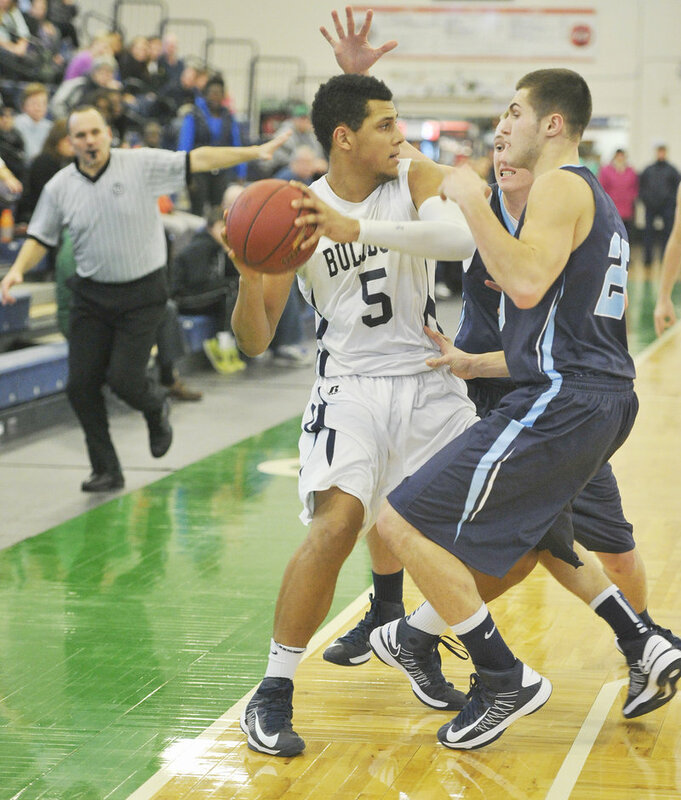 The Bulldogs were scoreless in the final three minutes. 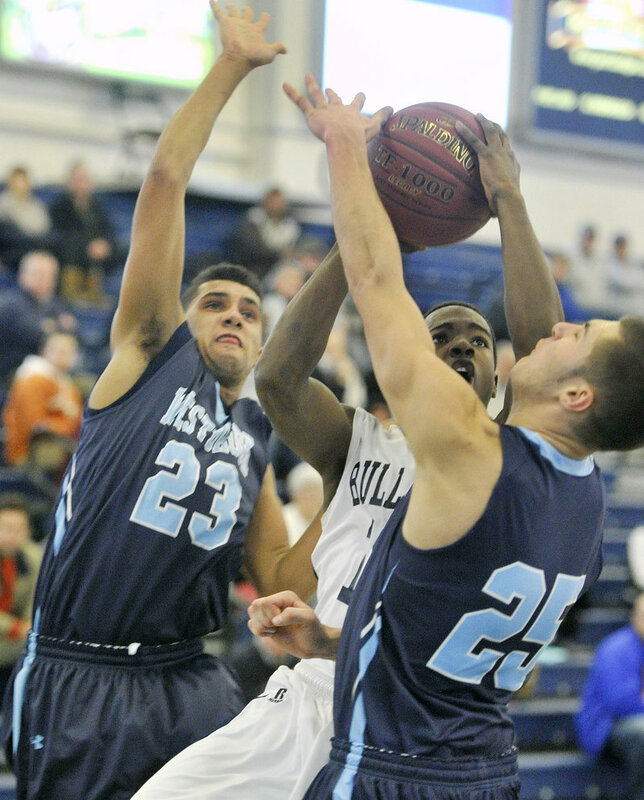 The Bulldogs (10-2) won their first 10 but went cold in both losses. 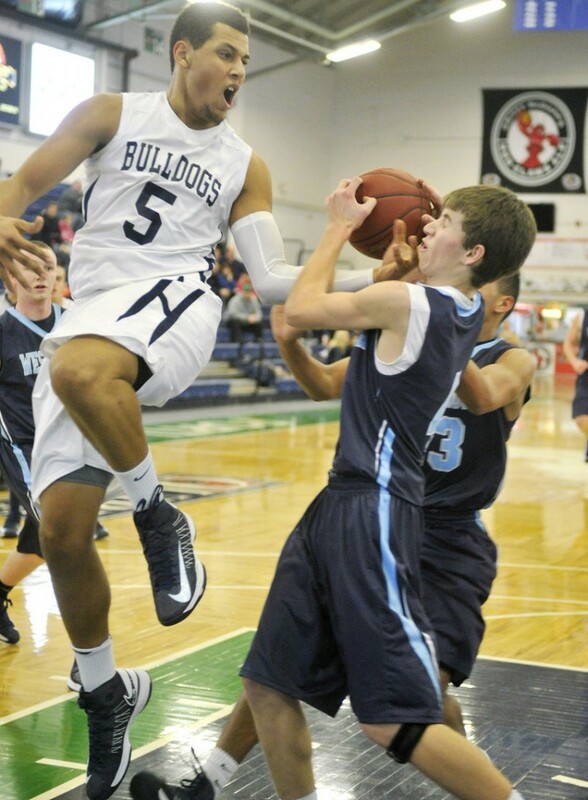 Portland only scored five points in the fourth quarter in a 12-point loss Friday to Thornton Academy. It appeared neither team wanted this one; the late stages were marred by turnovers. Portland had a five-point lead with just over two minutes remaining, but in the final 1:14 was called for a double-dribble and made an errant pass that Aaron Duncanson intercepted. The big basket for the Blazes was Keenan Lowe’s 3-pointer from the side with 35 seconds remaining that cut Portland’s lead to 45-44. The Blazes then forced a jump ball but gave it right back on a travel. The Bulldogs returned the favor on Duncanson’s interception. David Breunig took a shot in the paint for Westbrook that was long. Hazlewood got the rebound and was fouled on the putback. Portland brought the ball downcourt and Nate Smart’s shot to win it from the left hit the front rim. Hazlewood handled his nerves. Both free throws found all net. The Blazes scored the first seven points and led 13-4 after a basket by Breunig, who scored eight points in the opening quarter. Westbrook led 17-9 after one. The Bulldogs picked up their intensity in the second quarter. Trailing 19-9, Portland went on a 14-0 run. Matt Talbot started the run by banking in a 3-pointer from the top of the circle. Justin Zukowski had a 3 in the run and Smart contributed two baskets. Portland led 27-23 at halftime and led the entire second half until the final minute. Westbrook found the stamina to make the big shots at the end and hang on. “A lot of kids on both teams played a lot of minutes,” said Westbrook Coach Mark Karter. “We were lucky to execute and make two big free throws. This is a huge win. It’s nice to compete against a quality team and make people think about us. When we do the things we can do, we can be a pretty good team. Zach Bean, Duncanson and Breunig all had 10 points for Westbrook. Talbot led Portland with 11.